As we know not so long time ago, the most famous internet browsers Google Chrome and Mozilla Firefox stop support of JAVA. But afterwhile Mozilla decide to make one version that will support JAVA and all people that use Firefox for JAVA applications was very happy about that decision. Here following THIS LINK, you can download this version of Mozilla Firefox 52 ESR (Extended Support Release). 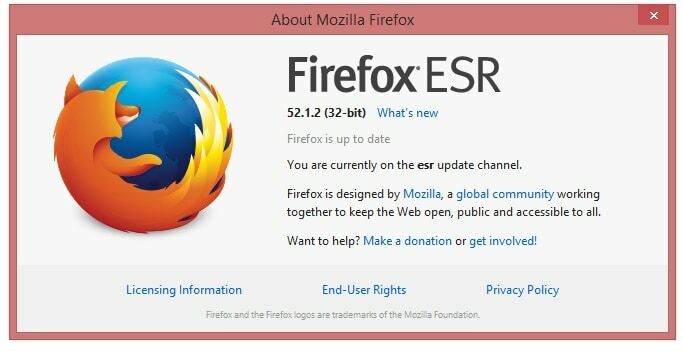 Following the link, you will open the official Mozilla website, from where you can download Firefox ESR for different types of operating systems and different languages. The most downloaded for sure it will be the link for Englis Language for Windows Operating System, so to spare some time for you, just click HERE for a download of this version. After installation of the Firefox 52 ESR, if you have previously installed JAVA, you can test is JAVA working, by click here to use the JAVA Verify Tool. You need to Click on Activate Java Button after that you will be prompted for Run, and if you have the latest version of Java you will get Congratulation message, and if not, you will be offered to update Java to the latest version. This entry was posted in Software and tagged Firefox, Java, Mozilla by Tome Trajkov. Bookmark the permalink.